So I kind of have a watermelon problem. I either a) cut into these suckers as soon as I get them home, then proceed to eat my bodily weight in sweet, sweet fruity goodness or b) plonk the giant ball o’ fruit on my kitchen counter, then promptly forget all about it until I cut into a big, wet sphere of sugar filled mush. BLECH! At that point, I curse myself because spitting out that slush-fest of grossness isn’t too pleasant. And then I feel bad about wasting food, because that’s how my grandma raised me. But there’s an easy way out of the grandma guilt here. You might not be able to chow down on that watermelon, but there ain’t nothing to stop you from blending that bad boy into a great summer drink! Which is how I came to make this Watermelon Agua Fresca for the first time: as an emergency fruit saving tactic. When you’ve let your watermelon go beyond ripeness into the mush stage, it’s actually perfect for blitzing into a drink because it has all the ridiculous sweetness of ripe watermelon and the fibers have already started breaking down. All you gotta do is chop it into chunks, throw it into a blender until it’s all smooth, then push it through a fine mesh sieve for a naturally sweet juice fest. A little confession: I’ve called this recipe an agua fresca, which traditionally are made by blending up ripe fruit, a little sugar and some water. But this recipe is a sneaky little thing, because if you’re using that “oops, I did it again” mushy watermelon, you’re definitely not going to need to add any extra sugar, since it’s holding its own in the sweetness department. Speaking of sneakiness, I also don’t bother to add water in this recipe at the blending stage. I prefer not to cut the juice with added water until it’s time to serve. That way it takes fewer batches to blend a whole watermelon, the juice takes up less space in the fridge and you can customize it to your taste. That way, I’ve got a really versatile, pure juice on hand that I can use to serve as is, topped off with sparkling water to make Watermelon Agua Fresca, or even whipped up with a few adult additions to make a sweet summer cocktail. Bonus: making your Watermelon Agua Fresca with sparking water instead of still gives it a nice little upgrade into mocktail territory, especially when served with a lime slice and a sprig of fresh mint. You can keep things super simple and stick with a straight Watermelon Agua Fresca, but I like to liven things up a little by adding a few ingredients to really make the flavors pop. Lime juice cuts the sweetness by adding a little citrus kick, ginger adds a lovely warm, balancing note and the mint is just downright light and refreshing. Don’t be freaked out by the ginger: it sounds like a lot, but against all that fruit, it just adds a subtle warmth in the background rather than being spicy-hot. If you’re not sure, you can always start off with a smaller amount of ginger and adjust as you go. Bonus points: you don’t have to bother peeling the ginger. Just chuck it into the blender, since any papery bits of skin will get caught when you run the juice through a sieve later. A quick note: you can absolutely juice up your watermelon a day or more in advance of whenever you want to serve the Watermelon Agua Fresca, but you might wonder what’s going on the first time you go to grab a pitcher from the fridge if you’ve left it sitting overnight or more. Don’t worry: it’s totally normal for the juice to separate into a lighter, watery layer on top and a more pulpy layer on the bottom. It’s okaaaaay! You can either give it a good stir in the pitcher, or throw it back in the blender for a quick whiz that will give you back a little froth on the top. 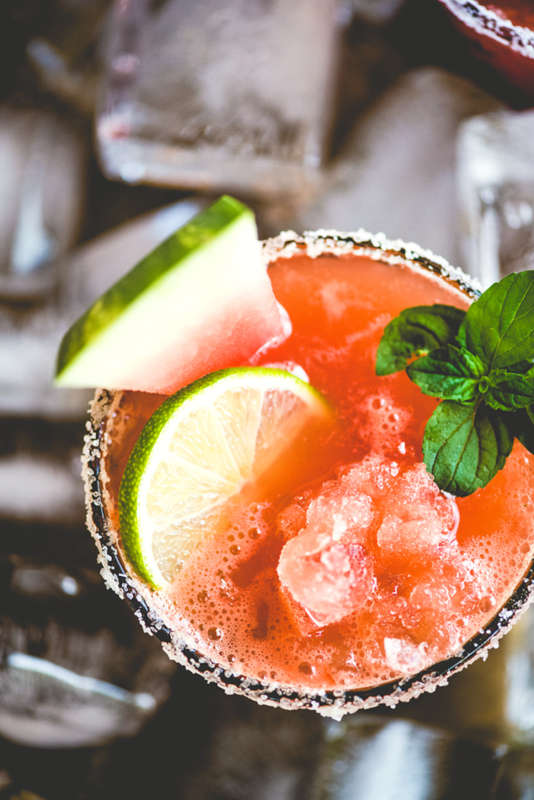 Since this Watermelon Agua Fresca is a lovely, naturally sweet beverage, I like to serve it in glasses with a salted rim for a nice contrast and to be a little fancy. Just rub a wedge of lime around the rim of your glasses and dip them into a shallow plate of coarse sea salt for a pinkys-out cocktail appearance. Or you could go one better and add a splash of your favorite adult beverage if you so choose. No judgement here! And for a fun, slushie-like texture, try serving over crushed ice. Whichever way you serve this Watermelon Agua Fresca, it’s the perfect taste of summer in a glass. This recipe was included in the Paleo AIP Recipe Roundtable! BLEND: Fill your blender with watermelon chunks about 3/4 full beneath the max fill line, then add the ginger (no need to peel), lime juice and fresh mint. Blend until you have a watermelon juice with no visible bits. STRAIN: Place a fine mesh strainer over a large pitcher and pour the watermelon juice through to strain out the pulp a little at a time. Use a spoon to stir up and press down on the pulp each time, then remove and discard it. Repeat until all of the juice has been strained. Add the remaining watermelon to the blender and juice it. Repeat the blending and straining process until all of the watermelon is juiced and pulp free. CHILL: Refrigerate the watermelon juice until well chilled, at least three hours. SERVE: I like to salt the rim of the glasses when serving this Watermelon Agua Fresca. Pour plenty of coarse sea salt onto a small shallow plate. 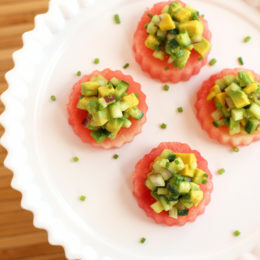 Rub each glass with a wedge of lime, then invert the glass and dip in the salt to coat. Repeat until all the glasses are salted. 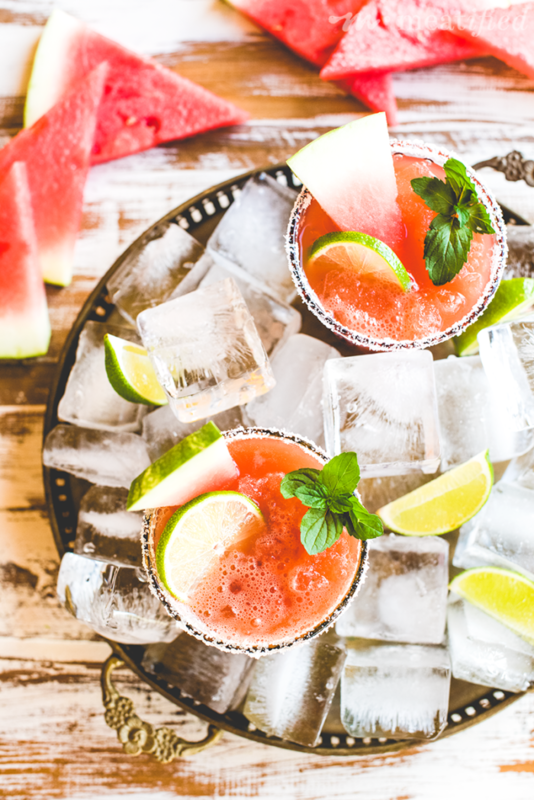 Serve the Watermelon Agua Fresca over ice with a slice of lime and sprig of mint, filling each glass about two thirds full and topping them off with sparkling water. Use crushed ice for a slushy like texture, or add a splash of your favorite adult beverage. I won’t tell!